What if your car took over all duties of driving for you? Would you have enough trust to sit back, relax and enjoy the ride if a machine was navigating the road? By 2022, there will be a new breed of cars coming to a street near you. Called autonomous vehicles, these self-driving cars will do all of the work and leave the “driver” completely hands-free. 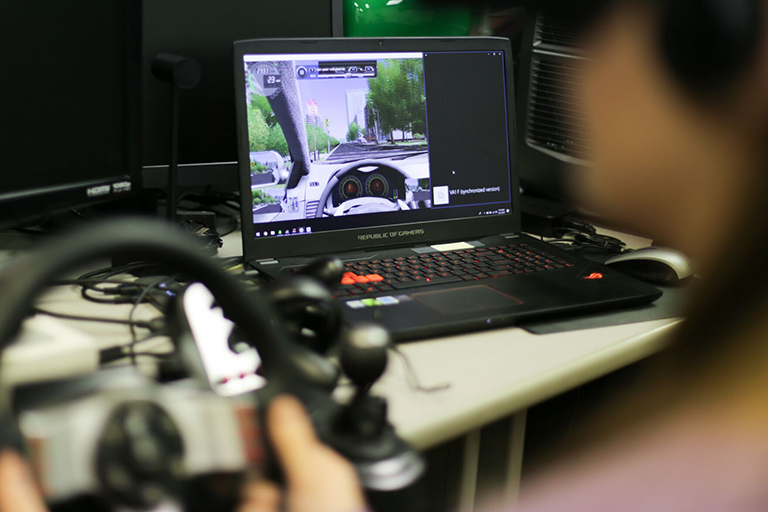 Robby Ratan and Taiwoo Park, researchers in the Department of Media and Information in the College of Communication Arts and Sciences, have teamed up to study the human component of autonomous vehicles, with a special focus on trust and comfort. 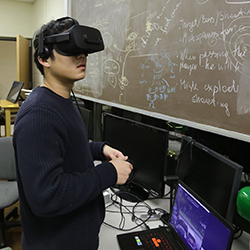 Joined by Communication Ph.D. candidate Sanguk Lee, the team has developed a virtual reality simulation of the self-driving car experience. Complete with a city landscape, pedestrians, stop lights and the typical hurdles that happen in everyday traffic, the experience created by Lee gives the participant the feeling of being a passenger in their own car. With the ability to go hands-free in an autonomous vehicle, enjoying the scenery, checking your phone or reading a book will become options on your daily commute. Lee’s simulation will present participants with that same feeling through an Occulus Rift virtual reality headset. While participants enjoy the simulation, the researchers will observe their experience. The idea of trusting a car to do all of the work may be new to many and the team is curious how easy is it for people to give up the control of piloting their own vehicle and put complete trust in their car. Trusting the vehicle you’re in is an ideal situation in a self-driving car. But, there is a catch. If you trust the vehicle completely and it lets you down, then just like anything else, there will be a certain level of frustration going forward. The study will launch during the North American International Auto Show Automobili-D. The event happens the week prior to the public opening and includes unique communities of participating organizations, companies and startups that cover key mobility areas. 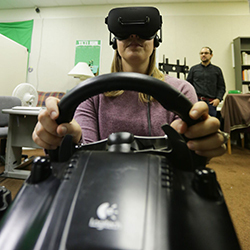 Researchers will introduce participants to their simulation in an exhibit space dedicated to showing off the work MSU is doing on connected and autonomous vehicles, including MSU’s own autonomous vehicle built by the College of Engineering. The simulation will give participants an immersive look at what it would be like to have a car in control of getting them from Point A to Point B. Along with trying the simulation, the participants will also be asked to complete a short questionnaire on their experience. In addition to questions on trusting the vehicle, the team will also ask participants about their enjoyment and comfort levels during the simulation, among others. After the show, the study will continue into the spring. Once all data is collected and analyzed, the team will send a set of papers on their results to journals and conferences in their fields, such as the ACM Special Interest Group on Computer-Human Interaction as well as the International Communication Association. Their findings have the potential to be used by car manufacturers to create better autonomous vehicles that people can trust.